Search for all "Anti-Remicade (Infliximab)"
Mouse anti Human Anti-Remicade (Infliximab) 108G4.03. Product is tested for ELISA (detection). 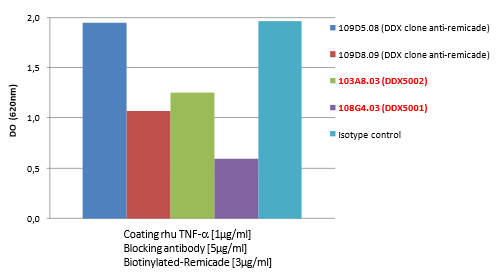 DDX5001P-50 DDX5001P-100 Purified: Bridging ELISA positive control for anti-Remicade detection, Inhibition of Remicade binding to TNF-α, Capture antibody for Remicade detection. 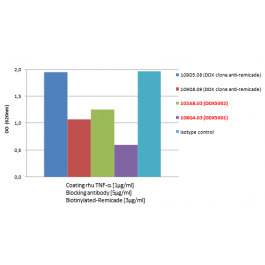 DDX5001B-50 DDX5001B-100 Biotin: Detection antibody for Remicade detection. *This monoclonal antibody may be used between 5-25μg/ml. *Coupled antibody: to maintain RT before use. Remicade® (Infliximab) is a chimeric monoclonal antibody targeting TNF-α, used for the treatment of autoimmune diseases such as rheumatoid arthritis, ankylosis spondylitis, Crohn’s disease, psoriatic arthritis or ulcerative colitis. We have generated a panel of anti-Remicade® (anti-Infliximab) monoclonal murine antibodies. These antibodies can be used to develop and calibrate Remicade (Infliximab) and anti-Remicade (anti-Infliximab) detection assays. Purified: 100 μg in 200 μl / 50 μg in 100 μl Tris-NaCl pH 8. Coupled: 100 μg in 200 μl / 50 μg in 100 μl PBS 50% glycerol. Cross-reactivity: negative for rituximab (mabthera) and roactemra (tocilizumab).